This last week Celebration, Florida was known as the culinary capital of the world as the World Food Championships rolled into town. 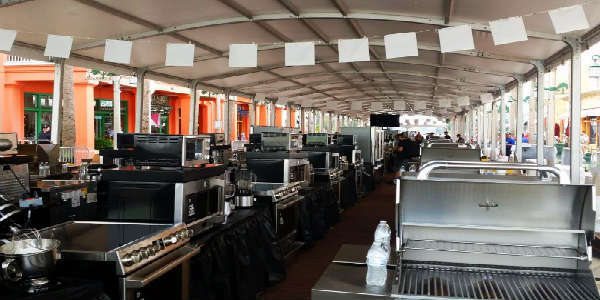 Market Street was transformed into the Kenmore Kitchen Arena as over 1100 professional and home Chefs competed in 9 culinary categories for their share of the $350,000 in prize money. The event officially kicked off November 3rd and will conclude on the final fight night tonight, on November 10th. Competitors will have had to survive through two rounds in their respective categories before duking it out in the final table competition, in which that winner will win the coveted World Food Champion and $100,000. The categories range from barbeque to bacon and the general public is invited to watch the competition and sample food on the free tasting tent. As part of the competition, the WFC invited 50 bloggers from around the globe to participate in the Food Fight Write Blogging Summit the first three days of the event. Emily Ellyn, of Food Network fame, hosted us on Day One where we learned all about the WFC and the world of food sport. Our fabulous three days was going to end with a cook off featuring Kansas City Steaks so we received advice and tips about how to cook the very best steak under stressful constraints- just as true WFC competitors. The blogging summit continued on the second day with a day-long field trip where we visited local culinary establishments throughout Central Florida. The first stop was to Long and Scott Farms where we learned about the world of farming. We sampled corn right off the cob, took a hayride through the fields and stocked up on homemade jams and syrups. The second stop was to learn about the sustainable seafood at Sea World with our very own private dining experience with Shamu. We enjoyed fresh mahi steaks and BBQ while getting to know some of the Sea World animal trainers and rescue team members. And the killer whales performed a special show for us. The fine folks at Sea World also whisked us away for a spin on Manta, the flying roller coaster and allowed us to get up close and personal with some of their animal ambassadors. Our final stop of the day was at The Oasis Club of ChampionsGate where we toured through showcase homes and had a pizza party with Emily Ellyn and learned to bake perfect cupcakes with Manuela Kjeilen, a blogging baker from Norway with over 1.3 Instagram followers and her own TV show. The final day we spent preparing for our own competition. Although the weather was unusually hot for November, it was even hotter in the Kenmore Kitchen Arena as we prepared our Kansas City Steak filets for our chance to be crowned a World Food Champion. Winners were announced later that evening at the World Food Championship kick off reception at the Westgate Town Center Resort in Kissimmee. Now that my portion of the competition is complete, I plan on watching the real pros work their way around the kitchen and win the big prize money. Tickets to tonight’s finale are unfortunately sold out, but the good news is there is a good chance this event will be back next year in Central Florida. For more information on the World Food Championship, visit worldfoodchampionships.com. Anna-Marie Walsh is the Head Beet at Beauty and the Beets (the Beauty title has been claimed by the cat). She writes about traveling, visiting unique restaurants and eating vegetables. By the way, though, the photos are not coming up. Don’t know if you can change that.